I have always wanted to create a royal combination of colors for a bold bride with a sharp sense of style. 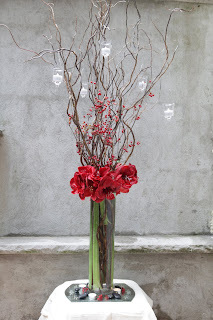 The centerpiece is made up of Ferrari red Amyrillus, red berry branches, and tall curly willows. 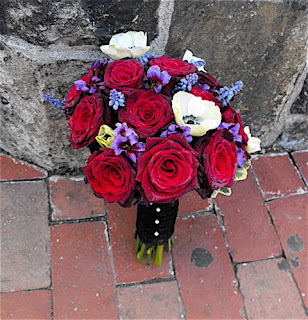 The bouquet is made of Black Baccara roses; (my favorite), blue Muscari, and Anemonies. The handle has been wrapped with a gorgeous black cross hatched linen material with little white pearl pins to secure/decorate. The mothers posy is also made of Black Baccara roses, blue Muscari and a gorgeous texture foliage called Wave leaf. 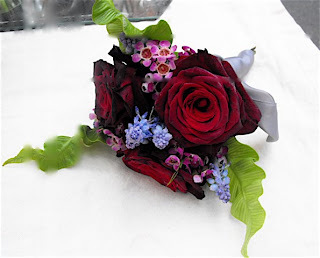 Posy's are a modern choice for the Mother's in place of a corsage.